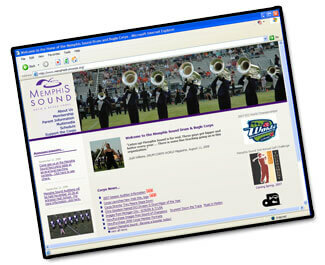 From a Memphis Sound press release: Memphis Sound is pleased to announce the launch of its updated Web site which replaces the site launched at the beginning of the corps' 2003 season. "The new site has an improved look and feel, provides a more streamlined browsing experience for users, and incorporates many of the photos taken of the members over the past four years," said Pat Bohannan, Memphis Sound webmaster and tour manager. Additionally, the information throughout the site has been updated to reflect the current philosophy of the corps. The launch of the new site also corresponds with the unveiling of the corps' new logo. The logo was designed during the summer by Signature Advertising, a Memphis marketing firm. The artwork depicts an "M" over an "S." The "M" is visually identical to the Interstate 40 Bridge linking the city of Memphis with Arkansas, and the "S" represents the lazy Mississippi River as it passes under the bridge. "This ties the image of the corps directly to one of the iconic symbols of Memphis and the Mid-South," says MYPAA Board Member Rick Moore. Check out the new logo as well as the new Web site at www.memphisdrumcorps.com.